Did you plant a lilac bush and have lovely flowers the first year and nothing since then? Or maybe you’re not getting the flowers that you used to get from your established lilacs? According to Jack Alexander, the chief plant propagator at the lilac-magnificent Arnold Arboretum at Harvard University, newly planted or transplanted lilacs tend to have transplant sulks. Most spring-flowering shrubs, lilacs included, form flower buds the previous year. That initial display you see when you buy new shrubs was set when the lilac was still comfortably at home in the nursery. When it was moved, the disturbance set it back. Give it a bit more time, and whatever you do, don’t move it again! Common lilacs (Syringa vulgaris) and the French hybrids based on them are especially sensitive in this regard. If you’re the type who likes to move the furniture around, try planting ‘Miss Kim’ (a cultivar of S. patula). She’s a bit less fussy about an occasional relocation. ‘Miss Kim’ is easy to find at nurseries, as are a good number of S. vulgaris varieties and cultivars. But for the widest selection of colors, fragrance, and bloom times, mail order is the way to go. Lilacs have to grow for a few years before they start flowering. After that, they bloom in spring on year-old wood, the stems that grew from the older branches during the previous summer. Pruning consists mainly of removing elderly trunks and clipping off seed heads within reach. But if you want to cut back young growth, the proper time is right after flowering. It should be done as soon as possible, and no later than three weeks after petal fall. If you are not pruning too late or cutting off all of the new growth, the problem may be too much fertilizer, which could push vegetative growth at the expense of flowers. Or, maybe the problem is a lack of light. Lilacs need plenty of sun to flower well, and shade is the most common culprit when mature bushes fail to bloom. Remember, too, that if you go through a summer of little or no rain, the plant will be unable to set buds for next year so you can expect little or no flowering the year after a drought. During a garden walk near Elgin, Illinios I saw the lighting feature that was very intriguing. At first it looked like canning jars attached to an old board. In reality the “board” was the tongue from an antique hat wagon. That in itself is a striking feature but each of the jars contain a light bulb. These look like 20 watt candelabra base bulbs. C6 or C9 Christmas lights would work just a well. Another garden on this walk had an amazing fountain. The clear ball is about 2 feet in diameter. The water cascades down the sides of the ball. The mirror in the background added a lot of depth to the garden. The owner did say that the ball does need to be replaced every 3 years. These invasive worms jump when handled. As you are doing yard clean-up this fall, there is yet another new invasive pest to look for, identified in Dane County in October of 2013. Jumping worms (Amynthas spp.) are of Southeast Asian origin and they can be very damaging to soil structure in gardens as well as forest environments. No earthworms are native to Wisconsin—they were all killed off during the Ice Age. We do have 20 European species in the state, however. Earthworms all have negative effects on the forest duff or litter layer, which acts as a protective cover and helps forest floors to retain moisture, insulate tree roots, provide nutrients, prevent erosion, etc. When that litter is eaten by earthworms, the protective cover is removed, exposing the soil and causing erosion, compaction and increased runoff. This disturbance favors the spread of invasive plants such as garlic mustard and buckthorn. Researchers have also documented the negative effects of earthworms on forest regeneration and ground nesting bird populations. The jumping worm is especially destructive since it lives right in the duff layer rather than lower in the soil profile. Jumping worms tend to outcompete European earthworms to become the only species in forest environments. They consume the layer of leaves and other organic matter on top of the soil faster than other earthworm species. They have been found in Dane, Sheboygan, Jefferson, Waukesha, Milwaukee and Racine counties, and signs of the worms (though no adults) have been noted in 8 other counties. Jumping worms have also been found in some states in the Eastern U.S. We don’t know how long they have been here in Wisconsin, but introduction through contaminated soils or plants is suspected. Since they can spread very quickly, it is important to slow the spread. Best management practices are being developed by the DNR and municipalities. Don’t share plant divisions from your garden or soil if you know you have jumping worms. Jumping worms are parthenogenetic, producing eggs without the need for a mate, so just one worm can start a new population. Their eggs survive as microscopic cocoons over winter, with all the adults dying in fall. You won’t see the young worms until late June each year, but you will see the ‘soil signature’ from their feeding during the previous season. Jumping worms feed on soil organic matter, leaf litter and mulch and create very grainy-looking and hard little pellets when they excrete. The excretions resemble coffee grounds, and have poor structure for plants to grow in. 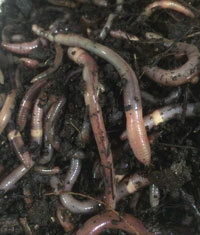 Also, the worms’ feeding removes the organic matter that plants, fungi and bacteria need for nutrients. Adult jumping worms are 3 to 5 inches long but can grow to up to 7 inches in length. Jumping worms resemble regular earthworms but there are some important differences. Unlike European earthworms, they don’t produce slime and are more gray or brown in color than pink. Their clitellum, the band of lighter-colored tissue near the head, is smooth, not raised like other earthworms and whitish, not pink. It also goes all the way around the body, not just partway, like the European worms. The body is more rigid as well. Jumping worms get their name from their behavior—when handled, they thrash violently, may jump into the air or even shed their tails. They move in a serpentine fashion like snakes, as well. Check out this video to observe them moving. After hatching in late June, each worm begins reproducing; their life cycle lasts 60 days, so we can have two generations easily each year. Unfortunately, other than killing any worms you find by placing them in a closed plastic bag in the sun, there are no products labeled to kill them, since soil drenches would also kill beneficial soil organisms. Some products are being tested, but I haven’t heard about any results as of yet. To report a sighting of jumping worms, email Invasive.Species@wi.gov . For more information and to see photos, visit http://dnr.wi.gov/ and search for the keyword ‘jumping worm’. There is also a great article in Wisconsin Natural Resources that you may want to check out . Editor’s note: these worms have also been identified in Outagamie County. This is a fantastic recipe for the glut of tomatoes in the summer. I like to use it for that last crop of the year, when there isn’t enough for a big canning session but too much to eat. Passata is such a useful store cupboard item to use in all sorts of savory dishes. You can use it as is for a quick pasta dish, pizza sauce, add it to premade tomato sauces and soups for an authentic taste. If you are all canned out, simply pour the finished passata into containers and freeze to use in the winter. Add some to risottos, gumbos, soups, stews and polentas for a rich undernote of harvest. Cut the tomatoes in half and place then cut side up in a single layer in a large roasting pan. Scatter the shallots, garlic, herbs, salt, pepper, sugar and oil over the top. Roast for about 50 minutes to one hour, until the tomatoes are well softened. Remove from the oven and puree using a food mill. Put the tomato puree into a pan, add the lemon juice and bring to the boiling point. Pour into hot sterilized jars and seal. Water bath for 35 minutes. Use within one year. Once opened, refrigerate and use within a few days. Always practice safe canning – http://nchfp.uga.edu/publications/publications_usda.html will answer all your questions. Start by choosing a location where they can grow undisturbed for the foreseeable future. Peonies are long-haul plants, not at their best until they have been in place for some years. Test the soil in the planting spot to be sure it has a pH of at least 6, although 6.5 to 7 is better; amend it with dolomitic limestone if necessary. If you’re moving the plant, cut off the discard the spent foliage. Dig up and handle the roots carefully as they are quite brittle. Dig planting holes roughly twice as deep and wide as the peony roots. Prepare the soil by working in a few shovelsful of compost. Set the roots in the prepared holes, making sure the budlike eyes are no more than 2 inches below the ground. Backfill gently; don’t tamp down around the plants. Water them in, then top off with additional soil if necessary. After the ground is frozen 3 or 4 inches down, add a protective blanket of straw, shredded leaves, or bark mulch. Do not fertilize until spring, when a generous application of compost will be welcome. Note: there is an old wive’s tale that says you shouldn’t cut more than a third of your peony blooms or you’ll have fewer flowers the next year. Wrong, wrong, wrong! Plants get nourishment through roots and leaves and use it to make flowers and fruit. The flowers are takers, not givers, as far as the plants resources are concerned, and you could cut every one without hurting the plant at all. In fact, when flowers are removed, perennials can use the strength that would have gone into making seeds to do things like fight disease, put out replacement foliage, and build up their underground resources. The one-third business probably got started because peonies have short stems. When you cut them for the vase, you usually take a lot of the foliage, too, and a plant does need its leaves to stay healthy. So, leave the leaves, take the flowers, and don’t forget the “get rid of it” rule: even healthy-looking peonies usually harbor fungus spores that should not stay nearby or be composted. Send all peony flowers to the landfill, bury them a foot deep, or burn them. And one more thing: don’t attempt to eliminate the ants that crawl all over your peonies!! Peonies have tiny nectaries, specialized tissues that secrete nectar, at the edge of their bud scales (delicate leaf-like structures covering the bud). The nectar is a highly nutritious blend of sugars, proteins, and amino acids and it attracts the ants to the flower buds. In exchange for the nectar, the ants provide protection for the buds. Any bud-eating pest is attacked by the ant who make formidable foes since some of them can bite from one end and sting or spray from the other end. Don’t spray the ants with poisons or water — the peonies know what they need better than you do! If summer’s heat and drought conditions (at least at my house) have your garden hanging it’s head, perk things up with some tips for keeping borders beautiful even when stressed. Easy irrigation – a simple soaker hose is one of the most basic ways to irrigate. Lay a porous hose down on your garden, and it’ll weep water onto the soil. Because you’re applying moisture right at soil level, there’s less loss due to evaporation. Cover your hose with a couple of inches of mulch to protect it from the sun’s UV rays and help it last longer. Check your irrigation system to make sure all zones are programmed, then turn it on only when it’s needed. Sometimes it’s easier to water with a hose. Avoid dragging it all over the yard by grouping containers together. Stop weeds and drought stress. Plants that aren’t stressed by aggressive weeds or lack of moisture are healthier and bloom longer with more flowers. Ideally, you’ve mulched in spring, but it’s never too late to put some down. One of the best things you can do to keep plants fresh in summer is to apply a 2- to 3-inch layer of some type of organic mulch. If it’s looking a little thin or matted down in your garden, use a leaf rake to fluff what’s there and top it off, if needed. If drought stress has already affected your annuals or perennials and you notice brown and crispy flowers or foliage, go ahead and cut off what’s damaged. Sometimes the whole plant looks bad. In that case, prune all the dead-looking stuff out. Make sure there’s enough mulch and water so the soil stays evenly moist for the rest of the season. Many perennials will start growing again from the crown in a week or two. Some plants, such as bleeding heart, will go completely dormant, but grow again the following spring. Get rid of spent blooms. Deadheading often — even daily — will keep your garden looking its best. You’ll get a faster repeat bloom and avoid unsightly spent blossoms hanging around. Deadheading encourages your plant to produce more flowers and store energy for winter instead of forming seed heads. In fact, some people don’t like the look of hosta blooms so they cut them off below the foliage as they emerge. Heat stress and lack of water can make plants susceptible to pests and disease so keep a close eye on your plants and act quickly if you spot trouble! Rudbeckia Herbstonne is a very dramatic background plant. This specimen is 6 – 7’ tall and as you can see has the advantage of flower on the upper 1/3 of its height. Therefore it does not interfere with foreground plantings. It is a carefree plant. It does like rich well drained soil and will tolerate some draught once it is established. This plant in my garden was planted as two clumps about 5 years ago. The clumps have since grown together. Although it is does spread by rhizomes it general stays in its clump and is easy to control. Deer and rabbits tend to leave it alone but insects and birds love it. With a little dead heading it will bloom from late July into fall. I leave the stalks in place for winter interest.